This is not about Mo Lewis. Or Drew Bledsoe. Say what you want about the near-fatal blow that turned into the genesis of Tom Brady’s NFL career. But there was another turning point to the 2001 Patriot season that involved a linebacker hit, and it may have had more of an impact on the team than Lewis’ clobbering of Bledsoe late in the Week 2 loss to the Jets, 10-3. 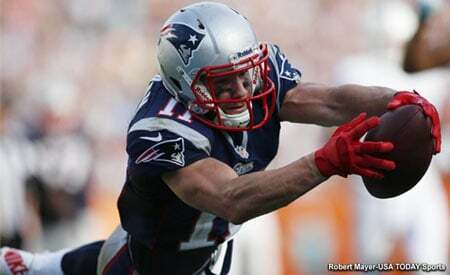 The Patriots staggered into their Week 3 match with Indianapolis at home. They were 0-2, listless, downtrodden and as forlorn as Noah looking for a unicorn in the famous Irish Rovers song. Meanwhile, the Colts opened the season with huge wins over the Jets and Buffalo. The Colts figured to munch out on the beleaguered Patriot defense, and Bill Belichick’s career Patriot coaching mark stood at a putrid 5-13. But on the game’s second offensive play, something very special happened. From out of the blue came a wake up call sent by someone who for years was a target of Patriot boo-birds, an extremely unpopular player in his career as a Dolphin, a Bear and a Jet. Jerome Pathon lined up split out to the left. He ran a quick slant towards the middle of the field, and caught a quick strike from Peyton Manning. A split second later, a thundering boom was heard, and Pathon was sent crashing to the ground faster than if an anvil had just fallen on his head. Bryan Cox met Pathon just after he had caught the ball, and leveled the Colt receiver with a jarring blow that changed that whole game, and the whole Patriot season. In Super Bowl XXXVI, St. Louis receivers were clobbered the entire game by the exotic dime packages designed by Belichick. Each and every hit applied to a Ram receiver traces its lineage back to that hit from Cox on Pathon. If Lewis’ hit on Bledsoe changed the season for the Patriots, Cox’s hit on Pathon defined it. From that moment on, the Patriots became a physical team. Cox would eventually go down to an ankle injury courtesy of Dan Neil of Denver, but the crew he left behind at the linebacker position more than made up for his loss with solid play in 2001. This crew was so good that Ted Johnson was relegated to a backup role, and the group made Andy Katzenmoyer totally forgettable. Once Tedi Bruschi established himself as a force at middle linebacker, Johnson could no longer reclaim his job. If the Patriots had stayed with a base 3-4 defense for most of the season, Johnson might have seen more playing time. But the 4-3 was less susceptible to yielding lots of rushing yardage, so Johnson sat while Bruschi enjoyed a breakout campaign. Bruschi, along with Cox, symbolized the intensity on defense for the Patriots. Aside from being an incredibly intelligent player, Bruschi quickly gained a reputation for being a hard hitter despite his smallish size for his position. After having played most of his career as a situational outside linebacker, Bruschi became more of a force in run stoppage and situational pass rush downs. Mike Vrabel more than repaid his debt to the Patriots after making the decisive defensive play on Bledsoe in a 1997 Pittsburgh 7-6 playoff win over the Patriots. Vrabel’s rush on Kurt Warner led to Ty Law’s interception return for a touchdown in the Super Bowl. But Vrabel had lots of big plays in 2001, including the interception that was the linchpin for the 17-16 comeback win at Exit 16-W in December. Vrabel was one of the free agent pickups who was transformed from someone the Steelers no longer wanted into a fixture for the Super Bowl champs. He had a steady season, providing solid support on the outsides. He was a main reason why, unlike past years, the Patriots weren’t as susceptible to screen passes. Roman Phifer enjoyed a rejuvenation in 2001. The long time Ram linebacker by way of the Jets played like a 24-year-old man in a 34-year-old body. He was often used as an extra pass rusher, and showed a great deal of speed for someone his age. His veteran savvy more than made up for his age, and he turned out to be another solid acquisition by Belichick via the free agent market. As solid as the 2001 linebacker corps was for the Patriots in ’01, it may turn out to be the top priority in the 2002 Draft. Johnson, Cox and Phifer are all free agents. Cox may ultimately wind up retiring, as his quest for a ring has finally been fulfilled and his re-signing may not be at all prudent for the Patriots. But what about Phifer, who may have two more good years left? Or Johnson, and his $6 million cap hit? Phifer appears to be on the short list of free agents that Belichick would like to retain. Adam Vinatieri and Antowain Smith carry a higher priority at the moment. Phifer retiring cannot be totally ruled out, but if Phifer leaves New England, he may choose to settle on a team close to his California home. The Patriots will not overpay for Phifer, and likely his resigning will come down to how badly he wants to keep playing. As for Johnson, he was left exposed to Houston and not taken. Johnson, who has battled a string of injuries following his breakout 1996 season, will either agree to do a contract restructuring or be released. Johnson will not play for the Patriots at his current salary. He is signed through 2003, and his backloaded deal is now coming into its costliest years. Whether Johnson re-signs or not, and the status of Katzenmoyer’s neck might determine how hard the Patriots hit this position in the draft. If Johnson, Cox and Phifer leave the team, and if Kat calls it a career, the Patriots are then dangerously thin at this position. Of course, the Patriots can always deal Bledsoe to Cincinnati for Takeo Spikes, or to Washington for LeVar Arrington, and all talk of linebacker problems are instantly solved. Getting another mid-range free agent may also be a possibility. Denver’s Bill Romanowski, ex-of BC, was out there until Oakland scooped him up and signed the 35-year-old to a seven-year deal. Kevin Hardy, London Fletcher and Earl Holmes are still out there, as are former Jets James Farrior and Marvin Jones. We always mention former Jets because of the Belichick factor. Whatever the case, look for the Patriots to address this position in the offseason. A starter at right outside linebacker needs to be nailed down, followed by a little depth. Don’t be shocked if that’s what the Patriots go for first in the draft, although the smart money is on a second year in a row at down lineman. Finally, there is strong sentiment for Cox to be retained, but as a coach of some sorts. Rob Ryan is the position coach, but Cox could become the next Pepper Johnson. Cox badly wants to coach, but has expressed concerns that he won’t get a shot because he is black. Making Cox some kind of offer as a coach would be a nice thing to do, in that you both allow him to retire at the highest possible football high he could achieve, and give him what he really wants. If nothing else, it would be nice payback to Cox for the great favor he did for the Patriots. It was a hit that Pathon will never forget, and a hit that Cox’s Patriot teammates never forgot, either. This entry was posted in Uncategorized on February 28, 2002 by Bob George.